Wellness, relaxation and health are an ongoing lifestyle choice. The Spa Room at Jacksonville Complete embraces this philosophy from the moment you walk through the door. Catering to both men and women, we distinguish ourselves from other spas by offering thoroughly personalized services according to the specific needs of each client. Our treatments and services are the center of our universe, focusing on effectiveness, with a generous dose of luxury and relaxation thrown in for good measure. Our therapists take a unique integrated approach to health and wellness, as well as a dedication to ensuring that you enjoy a very special experience with us. We believe that spa treatments should be a part of a personal wellness journey to feel great and look even better. The old idea that spa visits are a luxurious treat or reserved for special occasions no longer applies. With relaxing surroundings, innovative treatments and a talented staff, The Spa Room at Jacksonville Complete nurtures your body, invigorates your senses and relaxes your mind. Creating a truly relaxing environment where you are pampered and unhurried. 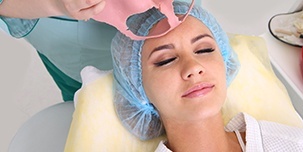 Providing treatments using industry leading products. Allowing you to interact with a staff that is passionate about your relaxation and healing. A busy schedule doesn’t need to keep you from having beautiful, radiant skin. With this treatment, we can make your skin appear more youthful and vibrant in just 30 minutes, enabling you to fit it seamlessly into your day. 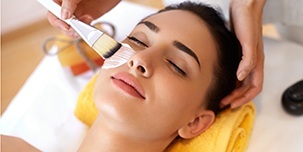 This gentle yet highly effective treatment will use a custom blend of innovative skin products to thoroughly cleanse, exfoliate, and tone your face in just 60 minutes. Our therapist will discuss your particular needs beforehand so they can formulate the perfect treatment just for you. The O2 Lift delivers a premium spa experience in the same location you can get a flawless smile. Using oxygen, plant derived stem cells, peptides, and specially concentrated enzymatic botanicals, this luxury treatment will exfoliate, illuminate, and oxygenate your skin to help its true beauty come to the surface, all in just 60 minutes. Your back should be pampered just as much as your front. This 60 minute treatment will consist of a back cleansing and exfoliation followed by a soothing massage using a combination of anti-oxidants and products designed to protect your skin from the harmful rays of the sun. This powerful physical exfoliation procedure will remove the top-most layer of dead skin cells along with the fine vellus hair (aka “peach fuzz”). This will trigger cell regeneration and allow our rejuvenating products to better penetrate into your skin. In just 60 minutes, it can completely transform your complexion. Each one only takes about 60 minutes, but the results will last for months at a time. Want to get rid of unwanted body hair on your eyebrows, lips, chin, or anywhere else on your face? Our team can gently and effectively give you the porcelain smooth skin you desire. Strong eyebrows and bold lashes are in these days, and rather than spending hours in the mirror trying to make them yourself, we can quickly give you this contemporary look in our Spa Room. Whether you want a subtle change or something outrageous and fierce, we’ll make sure everyone notices you when you walk into a room.